My name is Michele Stravato and I am from Aurora, CO (a suburb of Denver). I am married with two sons in college, my oldest, Joe, studying Civil Engineering and my youngest, Matt, studying Aerospace Engineering. I love cats, although we do not have any pets at this time. I was laid off from my job in November and am thankful to say I just received an offer letter and started my new job April 30! 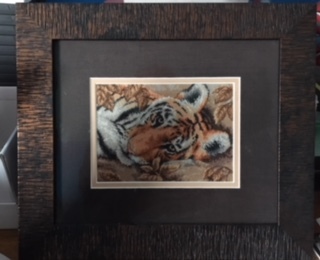 I have been stitching for over 35 years. I started cross stitching in high school and have taken a few breaks in my life but always return. I prefer 14 count as it is easiest on my eyes, but will stitch on 28 and 32 ct. I also stitch on plastic canvas. In 2013 I began making cards out of some of my smalls and at the urging of several co-workers started my blog and opened an Etsy shop ( now closed). I posted my first entry in October 2013. 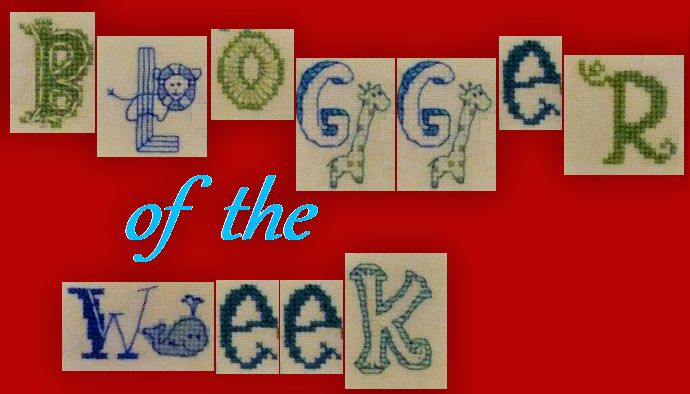 The blog is not as fancy as I’d like it to be, but I hoard my free time for stitching and don’t like to spend too much of my free time on the computer. I don’t post on my blog very often but you can find me on Instagram. (Instagram id is @crazyredheadedcrossstitcherr). I do post at least once a month as I belong to a monthly smalls SAL. I’m definitely a rotator, and thanks to the Facebook Group, Debbie's Ultimate Crazy Jan/Feb Challenge 2016/2017/2018, I’m now a serial starter. I made a start a day for all of 2016 and 2017, and have continued this in 2018. I’m not sure how long I will make a start a day for this year, but at least through April. I don’t have an absolute favorite designer, although I’ve been stitching a lot of Hooties from Pinoy Stitch lately. I love Halloween and Christmas and most of my stitching is for those two holidays. I also love smalls as I make cards. I have six pieces that I am most proud of. My husband and I received needlepoint stockings for our wedding and my name was misspelled so we never used them. Several years ago, I decided to make cross stitch stockings for my boys and I. This took a while as I started the stocking for my oldest and then took a year or two break from stitching due to busy life with kids. I made myself dig Joe‘s stocking out in 2013 and finished not only his, but the one for Matt and I. Of course, when I hung them up that first Christmas, my husband wanted to know why his was different. You guessed it, I made one for him the next year. 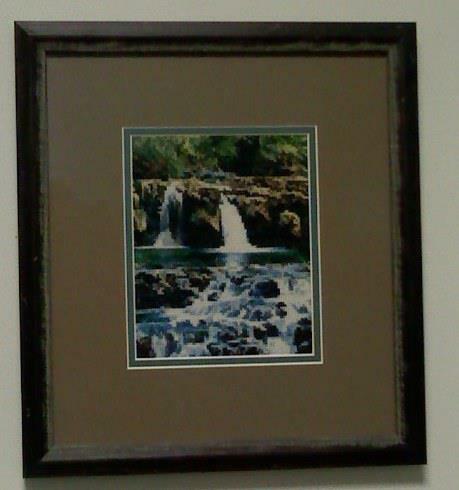 I also have an Artecy waterfall and Dimensions tiger that are among my favorites. I’d like to learn to tat. I’ve got an instruction book and the shuttle and thread, just need to take the time away from cross stitching to do it. I have a couple of drawers of finished-but-not-fully-finished pieces. It seems that if it isn’t small enough to fit on a card, I don’t turn the stitching into something useful. And making cards is my favorite finish for a stitched piece. I love experimenting with colored paper to add detail to a card. 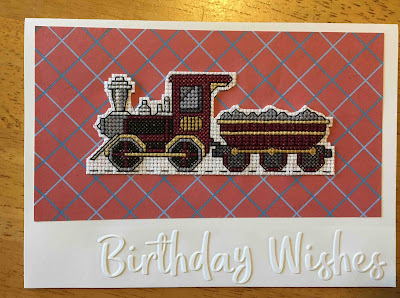 I recently purchased a die-cutting and embossing machine and am experimenting with ways to further enhance cards without taking away from the beauty of the stitching. This is a tough one, because I really love cats and Halloween. I have a piece called "Max in the Moonlight“ that is beautiful. The first cat I owned as an adult was named Max and looked similar to this one. 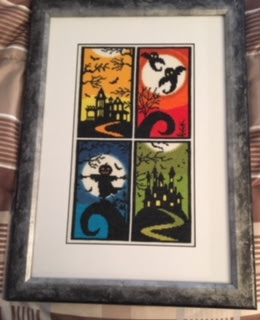 I also stitched and framed an Artecy Halloween piece that is very brightly colored. I am a closet paranormal freak and have been since the 7th grade! I love reading books about the paranormal and watching “Ghost Adventures“ and other similar shows. I know the shows are hokey and probably fake, but I still enjoy them. I am a blood donor and recently received my five gallon pin. I even got my boys to donate, although only Joe donates regularly. But then we lose cross stitching time. Sigh so much stitching, so little time! I love seeing all of your beautiful stitching Michele. Thanks Linda, I owe much of it to you and your wonderful Facebook group! Ooo, it must be such a relief to have a new position, congrats. :) A start a day for two years, no no, I couldn't even begin to comprehend that haha. I really like the Artecy Halloween piece! Thank you. It sounds crazy, but I make a lot of cards and it wasn't as hard to do as it sounds like. Hi Michele: Nice learning about you and seeing some of your finished designs. Nice meeting you!So many beautiful stitched pieces! I have only one stocking I made for my son but I love it!AriadnefromGreece! Thank you. They are fun to stitch, but scary to assemble. Thanks for sharing. Great answers. Lots of beautiful stitching! Nice to meet you Michele. Your stockings are beautiful as are your other pieces! Hope the new job is working out for you. Thanks Faith. The new job is going ok.
Hi Michele, nice to meet you! A start a day for more than two years...that is impressive! How many of those did get finished so far? Nice to meet another serial starter here. I love to start new projects but have never tried to start one each day for a certain period of time. You show some great projects here. So nice to learn about you Michelle. I'm a cardmaker also and I'm always impressed when someone adds a stitch to a card. I always hope the recipient appreciates the labor that went into it. You have completed some lovely projects and good luck on your new position.